Sing a song for serendipity 🙂 Glad at least one of us got that shot, it was too good to miss. A polarizer would have cut that glare (mine did) but you would have lost a bit of that contrast. Nice shot. The sea looks rather angry. Wonder if the kid got to build his sand castle. 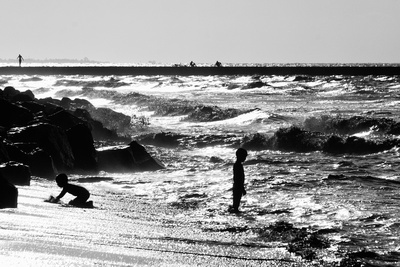 Nice shot of the silhouette of the boys against the waves. Brings back good old childhood memories when I had visited beaches and sea shores.